Sonia Michelson is well known in guitar circles for her popular method for teaching children, New Dimensions in Classical Guitar for Children as well as her other publications. 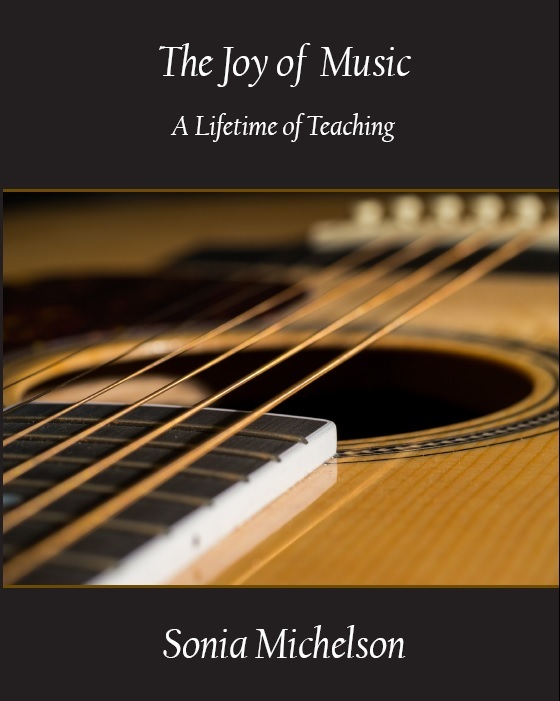 Michelson’s new book, The Joy of Music: A Life Time of Teaching, reflects on over fifty years of teaching classical guitar. The 121 pages cover both biographical subject matter as well as pedagogical and practical experience. There are plenty of ideas for teachers in this book. However, mature students will also find ideas about how to practice and assimilate material from their teacher. For example, in the chapter The Thirty-Minute Lesson, there is a good tip about having the student write down what they are to practice so they are involved in the teaching process. I was also glad to hear Michelson’s praise of Robert Benedict’s excellent book Sight Reading for the Classical Guitar, which covers daily sight reading material with emphasis on interpretation, phrasing, form, and more. Other chapters such as Ideas About Practicing, encourage well rounded approaches to the art of practicing as well as tips on encouraging students and avoiding confusion. So is this book a must have in your library? Well remember that the book is partly biographical so it’s not always going to be right to the point as with a reference book. However, teachers and students alike will find ideas and practical first-hand experiences from a teacher very interesting. Practical is the key word, this is not an academic book and there are no bibliographies or endnotes. You can read ten chapters at Michelson’s website so see for yourself. There many excellent books, both academic and not, in the piano world such as the The Well-Tempered Keyboard Teacher. However, the classical guitar has so little in the way of teaching outside of technique books. This book covers a very wide range of situations from teaching adults, teens, to young children. Because each student and teacher is so different most books present only one idea for everyone which is rarely practical. As a teacher I will keep this book in my studio for slow reading between students and will try out some of the tricks and tips to see how they work out. For that reason, I’m enjoying this book. Very nice review. I am actually interested in checking out The Well-Tempered Keyboard Teacher. Thanks again.